1. Can you outline how the Cementa festival has had a positive effect on the town of Kandos over the years since its inception? In terms of a festival, the four years of our operation is a very small time frame and it is a little premature to make pronouncements about the ‘positive effect’ we have had on the town. The effect of a festival that occupies only four days over two years, will not really be known for a number of years yet. I can say anecdotally that at least nine people have moved up. How many have bought? ……. people have and bought houses in Kandos and Rylstone as a direct result of Cementa. I do also think that the festival has put Kandos on the map for a lot of people in Sydney and has promoted the natural beauty of our area as great reason to visit and even settle here. We have begun to shift perceptions about Kandos and given a lot of people a reason to come up and pay us a visit. 2. A key element of the festival is the invitation for the Artists to spend time in Kandos on a residency. However the word ‘Artist’ can be difficult to define for some members of the community.. How has Cementa engaged with the local residents to help break down any preconceived ideas? I don’t think ‘artist’ is difficult for people to define. For people who aren’t used to contemporary art, it can come as a bit of a surprise to see installation, sound or video art when your concept of art prior to that is painting and sculpture. It will always come as a bit of a shock, but it’s really not that large of a leap and people here, like anywhere else, have made it easily. That doesn’t mean they are going to immediately like the new art, and they certainly don’t have to. I think this kind of engagement can be the most interesting – at times yielding responses that are far more significant than the well rehearsed repetitions that circulate in the art world. An artist at the first festival reported my favourite anecdote. The artist had asked an older gentleman what he thought of the art. His reply was that he didn’t like the art very much, but he loved the ideas. It’s a response you just would not get out of the art world. Perhaps the other side of this question is to ask, how will the challenge of addressing art to a non-art audience change how we think about and make art? Not to avoid the question, we have thought a bit about this. 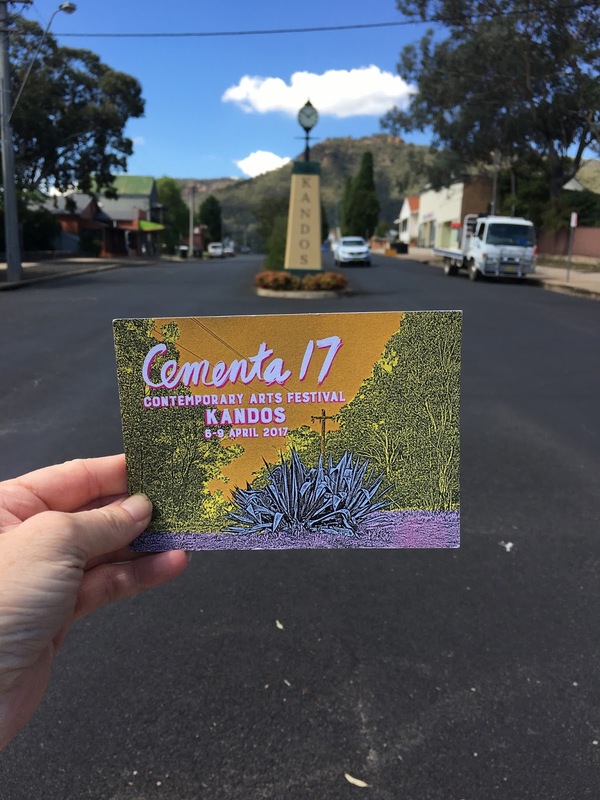 Asking artists to visit the town and make work that addresses the social, historical, cultural and environmental context of Kandos is central to our strategy for engaging the local and regional audience. It occurred to us that even if this audience is not familiar with the language of contemporary art, if the work addresses the town as its subject matter, this gives them a position from which to approach it. It gives them a way into the work, from an understanding and familiarity with the subject matter that means they do not need to depend on a familiarity with the conventions of contemporary art in order to feel comfortable or confident about their own experience of a work. We have also hosted a number of art works that engaged directly with locals, like Karen Therese’s “The District” in Cementa15, which was a conversation between locals from different backgrounds that festival visitors could participate in. Cementa15 also hosted 3 projects that directly involved engagements from high schools. We have also hosted a number of workshops in the practices of visiting artists to local kids and as a part of the development of Cementa17 we had an exciting engagement between two artists with disabilities and kids from the special education unit at Kandos High School. That said, we are aware that we are only scratching the surface and are working to further deepen our relationship and engagement with community. Community engagement will be a focus of Cementa19 and we are already planning a number of activities to better involve a larger section of the community but also to examine community engagement as an artistic practice. I think we have an exciting opportunity to look honestly at the role that community engaged art can take. 3. The number of Artists for each festival seems to be growing and growing and for 2017, includes an exchange program with artists in New York, but are local artists being invited or overlooked? We have included as many local artists who have been willing to participate by hosting a local painting salon. We give this exhibition our prime venue at Kandos Projects and even host it with its own opening. This is a great event for us because it is where all the local artists and visiting artists get to meet and hang out on the first evening of the festival. We also have a number of local artists that have participated by contributing work to the general festival every year that it is on. We also endeavor to bring in as many regional artists as possible. Engaging regional artists is a priority for Cementa, which gives opportunities to artists living across regional NSW an opportunity to participate in a major, mainstream art event. This is one of the chief challenges that any artist living in the regions faces and we are proud to have helped so many brilliant regional artists connect to the broader arts community. Beyond this, we have welcomed and promoted local ceramicist Debbie Stone to host her ceramics event, Ceramica at every festival and also the local painting group exhibition at the CWA. 4. Cementa is a free four-day cultural event and festivals like these cannot function without major financial support. Can you give us a little insight on where this festivals funding goes? As you say, the festival is free. We don’t charge money for entry, and frankly we aren’t really sure how it would go if we attempted to charge entry into a town, which is what we would have to do since the festival is held across the town. Thankfully, we live in a country where the arts are supported and the public funding we receive allows us to offer a vibrant contemporary arts festival in Kandos that is open to everyone, regardless of their economic situation. 90% of Cementa funding comes from State and Federal arts funding. This funding is earmarked for the arts and distributed through a highly competitive process of selection. It predominantly goes to the cities. Cementa brings some of this funding to our area. We endeavor to hire locals and use local services wherever possible. We also require artists to complete a residency at Kandos in order to make their work, which also means that all the artists contributing to the local economy while they are here. We have recently begun to attract private funding contributions and are working to grow this part of our support base. In addition to these forms of support, over the last four years Cementa staff and artists have contributed in unpaid labour, almost as much as we have received in funding.